A regular breeding resident, migrant, and regular species in the winter. Overwintering individuals are observed in southern Minnesota, including the Twin Cities. The Cooper’s Hawk was uncommon during the Minnesota Breeding Bird Atlas (MNBBA). The Cooper’s Hawk is widely distributed in many woodland habitats across the United States and southern Canada as far north as Alberta and Saskatchewan. 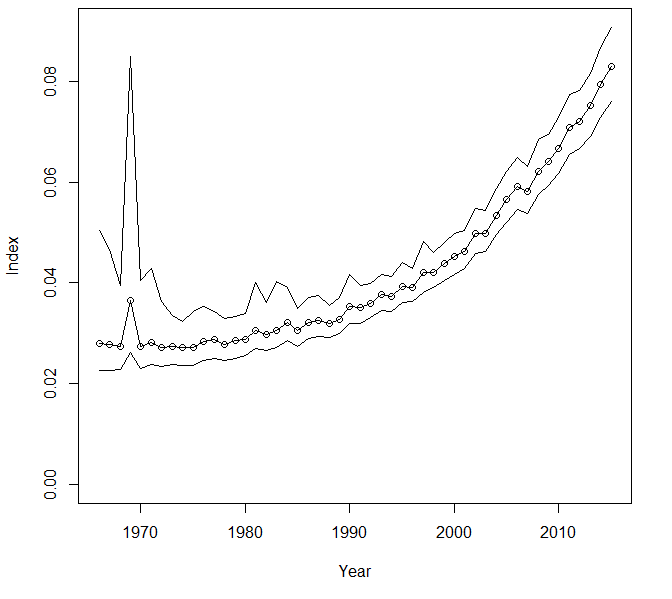 The species is not abundant anywhere, but populations have recovered and perhaps even exceeded their pre-DDT levels (Figure 1). Primarily a short- to medium-distance migrant to the southern United States and Mexico but may be a permanent resident in southeastern Minnesota. Carnivore focused primarily on medium-sized prey, such as robins, jays, thrushes, and woodpeckers, or mammals (e.g., chipmunks, squirrels and small rabbits), which it captures using brief perch-and-scan episodes in woodlands. Placed in both large deciduous and coniferous trees, usually ranging from 8 to 15 m high. Most are placed on preexisting bases, such as squirrel nests, previously used nests of other species, or detritus in the fork of a tree. Breeding distribution and relative abundance of the Cooper’s Hawk in North America based on the federal Breeding Bird Survey, 2011–2015 (Sauer et al. 2017). The Cooper’s Hawk is described as the quintessential “woodland” hawk by Curtis et al. (2006). The species’ population and breeding range have a rocky history over the past 150 years. Roberts (1932) reported that this species was “breeding throughout the wooded portions of the state,” but by the 1930s, it was “by no means as common as formerly.” He reported many confirmed nests from Minneapolis and nests with eggs in Anoka, Becker, Isanti, Marshall, and Polk Counties spanning the period from 1883 to 1928. Forty years later, Green and Janssen (1975) identified the Cooper’s Hawk as a “resident throughout the state; very scarce on the prairie in the west-central, southwestern, and south-central regions.” Johnson (1982), in his review of raptors nesting in Minnesota, identified 70 nesting records from 1883 to 1981. These records included locations in 23 counties, ranging from southeastern Minnesota, west to Brown and Grant Counties, northwest to Marshall and Polk Counties, and east to St. Louis County. He reported pre-1970 summer observations from northern St. Louis (1938), Lake (1953), and Cook (1967) Counties. Several years later, Janssen (1987) labeled the species as a breeding resident throughout the state, especially in the southeastern, east-central, and central regions, but absent from northeastern Minnesota. He confirmed nesting in 14 counties since 1970 within the same range described by Johnson in 1982. Hertzel and Janssen (1998) added 3 counties with confirmed nesting records since 1970, including a range extension to extreme northwestern Minnesota in Kittson and Marshall Counties. The Minnesota Biological Survey (MBS) documented 90 breeding season locations of the Cooper’s Hawk (Minnesota Department of Natural Resources 2017). The MBS locations were scattered throughout southern and western Minnesota, northwest to Marshall County, and east to central St. Louis County. Locations were most common in northern Morrison County and southern Beltrami County, but none were located in east-central Minnesota in Aitkin, Carlton, or Pine Counties, or in Cook or Lake Counties. The MNBBA documented 581 records of the Cooper’s Hawk, which were widespread throughout the state. Breeding evidence was found in every county except the following 8: Cook, Cottonwood, Jackson, Koochiching, Lincoln, Pennington, Pipestone, and Wadena Counties, which are spread throughout the state (Figure 1). Records were included from 9.8% (468/4,754) of all blocks and 11.6% (272/2,337) of priority blocks (Figure 3; Table 1). Confirmed nesting activity was reported from 42 counties, and these locations were also widespread throughout a substantial part of the state. The breeding records were most dense in the metropolitan area of Hennepin and Ramsey Counties, and in Crow Wing County. These regions were well covered by participants during the MNBBA. Evans (1982) summarized the rise and fall of the Cooper’s Hawk in the early and mid-1900s in North America. As described earlier, shooting and human persecution led to early declines in the species until legislation, law enforcement, educational programs, and improved poultry management led to improved conditions. In the mid-1900s, the effects of DDT caused additional population declines. Several other factors contributed to declines, including high nest predation, habitat loss, changes in forested habitats, and even excessive take by falconers. Today, with changes in poultry practices and the availability of alternate prey, such as Rock Pigeons, Mourning Doves, and European Starlings, conflicts with Cooper’s Hawks are more isolated events in the United States. Shooting still occurs in some overwintering areas, such as in Mexico. Curtis et al. (2006) stated that significant population increases and range expansions began to occur in the 1990s, when Cooper’s Hawks began to colonize urban and suburban areas. This activity was particularly noted in New York City, where the species had not nested since 1955. Two nests were recorded in 1999, and the hawks then rapidly colonized Long Island. The extensive confirmed nesting found during the MNBBA in the Twin Cities metropolitan area also exemplified recolonization and showed the potential positive impact of urban woodlands on the species, as noted by North and Faber (2014). MNBBA data also confirm the recolonization of the woodlots, riparian areas, and other suitable forested habitats in the western portion of the state where Green and Janssen (1975) formerly emphasized that it was scarce following the DDT era. In summary, the Cooper’s Hawk has made a strong population recovery in Minnesota since its decline and relatively low abundance throughout much of the 20th century. Most reports mention problems in identification of the Cooper’s Hawk, especially confusion with its smaller relative the Sharp-shinned Hawk. Vigilant identification of this species is especially warranted. The substantial range expansion and increase in this species’ population were also well documented in Michigan (Chartier et al. 2013), Ontario (Cadman et al. 2007), and Wisconsin (Cutright et al. 2006). Breeding distribution of the Cooper’s Hawk in Minnesota based on the Minnesota Breeding Bird Atlas (2009–2013). Summary statistics of records by breeding status category for the Cooper’s Hawk in Minnesota based on all blocks (each 5 km × 5 km) surveyed during the Minnesota Breeding Bird Atlas (2009–2013). Summary statistics for Cooper’s Hawk records by breeding status category for all blocks and priority blocks (each 5 km × 5 km) surveyed during the Minnesota Breeding Bird Atlas (2009–2013). Habitat used by Cooper’s Hawks for nesting was broadly described as extensive forests, woodlots of 4 to 8 ha, and occasionally isolated trees in more open areas (Curtis et al. 2006). Figure 4 shows typical breeding habitat in a woodlot in the western metropolitan area of the Twin Cities. Pine plantations were described as extensively used in southeastern Wisconsin (Rosenfield et al. 1991). Although Cooper’s Hawks formerly avoided urban landscapes, they have “adapted remarkably well” to human disturbance and habitat fragmentation and are now frequently found nesting in suburban and urban areas (Rosenfield et al. 1991). Evidence from Wisconsin, however, indicated high densities of nesting in conifer plantations and urban/suburban areas compared with other habitats (see Curtis et al. 2006). No similar data exist for Minnesota. Typical breeding habitat of the Cooper’s Hawk (© Gerald J. Niemi). Partners in Flight estimated a breeding population in the United States and Canada of 700,000 adults and a United States population of 600,000 (Partners in Flight 2017). They estimated a Minnesota population of 16,000. The MNBBA did not attempt to estimate a population, because of too few observations but also due to the species’ secretive behavior during the breeding season. Partners in Flight (2017) estimated also that the Cooper’s Hawk population has increased by > 200% from 1970 to 2014! In Wisconsin, Rosenfield and his colleagues at the University of Wisconsin–Stevens Point have completed considerable research on the Cooper’s Hawk. For instance, they estimated the Cooper’s Hawk population in Wisconsin was greater than 7,500 pairs; assuming a 1:1 ratio of males to females, this number would double to greater than 15,000 breeding adults (Bielefeldt et al. 1998). There are no density estimates available in Minnesota, but Curtis et al. (2006) estimated a density ranging from 331 to 5,000 ha per active nest in Wisconsin. They also reported nesting densities ranging from 1 nest per 292 ha to 1 nest per 395 ha in North Dakota. Several lines of evidence documented the increase in the species’ population across its breeding range over the past 50 years. The federal Breeding Bird Survey (BBS) data were unreliable for the Cooper’s Hawk in all states and regions, including survey-wide (Sauer et al. 2017). While noting the uncertainty and emphasizing that the trend should be interpreted with caution, it is worthwhile to examine the population trend in Minnesota from 1967 to 2015, which shows a strong positive increase (Figure 5). 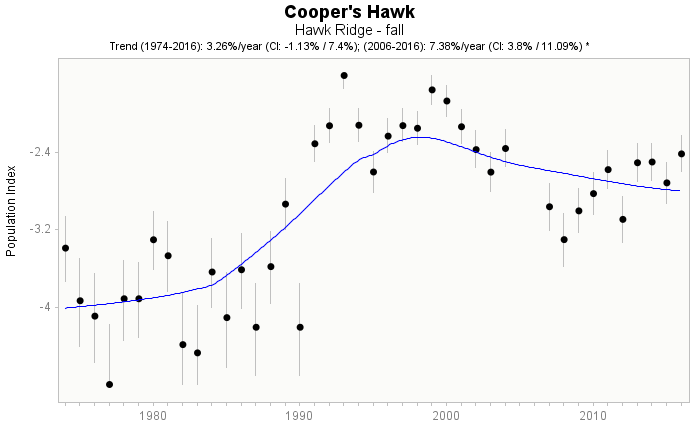 Fall data at Hawk Ridge in Duluth, Minnesota, indicated a nonsignificant increase of 3.26% per year in counts of migrating Cooper’s Hawks from 1974 to 2016 and a recent significant increase from 2006 to 2016 of 7.38% per year (Figure 6). However, the species increased substantially from the early to mid 1990s. Christmas Bird Count data presented in Curtis et al. (2006) indicated an increase in Cooper’s Hawks based on 1,628 counts from 1959 to 1988. Migration counts are among the best measures for determining the population status of species like the Cooper’s Hawk because they are more conspicuous during migration. Breeding population trend for the Cooper’s Hawk in Minnesota for 1967–2015 based on the federal Breeding Bird Survey (Sauer et al. 2017). Fall migration counts of the Cooper’s Hawk at Hawk Ridge, Duluth, Minnesota, as calculated by the Raptor Population Index from 1974 to 2016. The Cooper’s Hawk was formerly extirpated, endangered, threatened, or a species of conservation concern in 16 eastern states. As pointed out by Curtis et al. (2006), the Cooper’s Hawk “has recovered remarkably well from the two major eras that affected the populations of many raptors in North America: DDT and heavy persecution.” Recently Partners in Flight has assigned the species a low Continental Concern Score of 7/20 primarily because of its wide distribution, its increasing population, and its adaptability to human-modified landscapes. Mortality has been documented from a variety of causes, including collisions with vehicles and man-made structures, and nest predation by raccoons, Great-horned Owls, Northern Goshawks, and Red-tailed Hawks. Degradation of habitat may alter the suitability of nesting or foraging habitats, but the species’ use of selectively logged forests and plantations and their occupation of suburban areas suggest minimal, if any, effects (Curtis et al. 2006). Langham et al. (2015) and the National Audubon Society (2015) did not list the species as a concern relative to climate change, likely because of its more southern distribution and the species’ opportunity to colonize breeding habitats northward. A recent study by Rosenfield et al. (2016) found a statistically significant shift of 4-5 days to an earlier timing of egg-hatching in spring from 1980-2015 for the Cooper’s Hawk in Wisconsin. This shift was consistent with earlier spring arrival by Cooper’s Hawk in Wisconsin and suggests that climate change has not adversely affected this species, but as yet no changes in clutch size or brood size have been detected. Bielefeldt, John, Robert N. Rosenfield, William E. Stout, and Susan M. Vos. 1998. “The Cooper’s Hawk in Wisconsin: A Review of Its Breeding Biology and Status.” Passenger Pigeon 60: 111–121. Rosenfield, Robert N., Madeline G. Hardin, John Bielefeldt, and Edward R. Keyel. 2016. “Are Life History Events of a Northern Breeding Population of Cooper’s Hawks Influenced by Changing Climate?” Ecology and Evolution 7: 399–408.